We require just a 500 AED deposit in order to hold the table for you. Maximum 8 people per table. 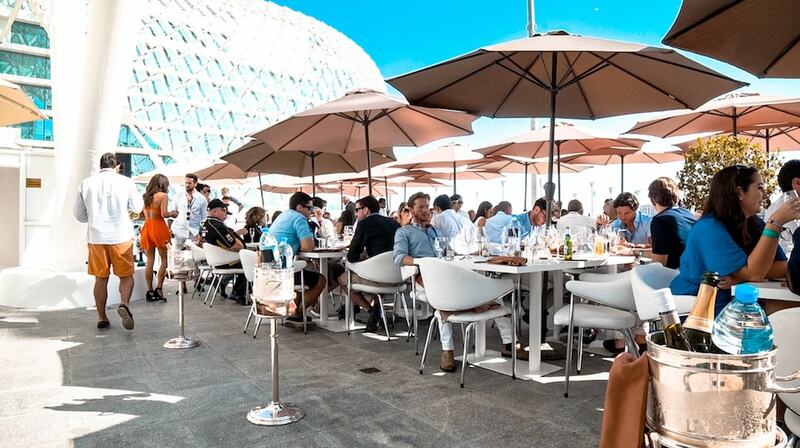 We Brunch Race Weekend is back again this year partnering with the Yas Hotel, and with events spread across 3 days, it’s going to be even bigger and better than last year! 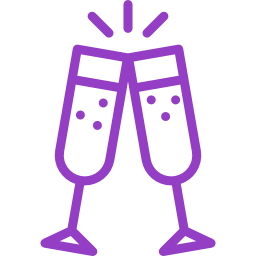 On Friday the 23rd of November you have the option of two brunches throughout the day, with the first one starting at 12pm followed by the second one at 4pm. Don’t forget about the after party at 8pm, the perfect way to start the weekend! We Brunch Race weekend could not have been better. The whole experience from the electric atmosphere throughout the hotel to the spectacular track views which we enjoyed during brunch were second to none! All We Brunch staff were amazing and very helpful and efficient, from help with the booking days before, up until the moment we left. The venue was outstanding, great drinks and the food was so tasty, with plenty of it! 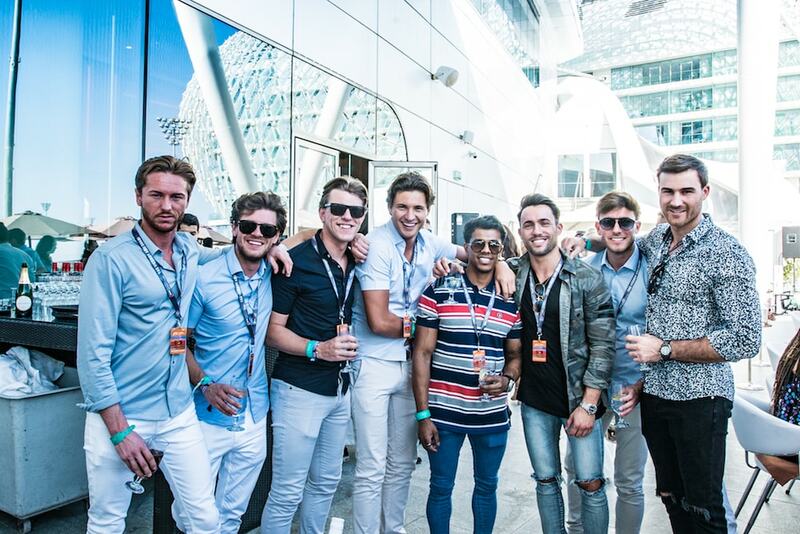 Thank you to the Love Parties team for a fantastic weekend in Abu Dhabi! I wasn’t totally sure what to expect, but was blown away by the whole experience, particularly the Atayeb terrace which is literally on the track! Absolutely brilliant brunch packages with great perks like the concert access, you couldn’t ask for more. Thank you all for a Race weekend we will never forget. See you next time! With the surroundings of the Marina, the best race track views from the terrace and the inclusive packages with attention to detail, it really made for an unbelievably exciting weekend. Having been to similar events over the years this without doubt is one of the best weekends on the sporting calendar, a great weekend with the unrivaled service from the We Brunch team is all the more reason to return in 2018. 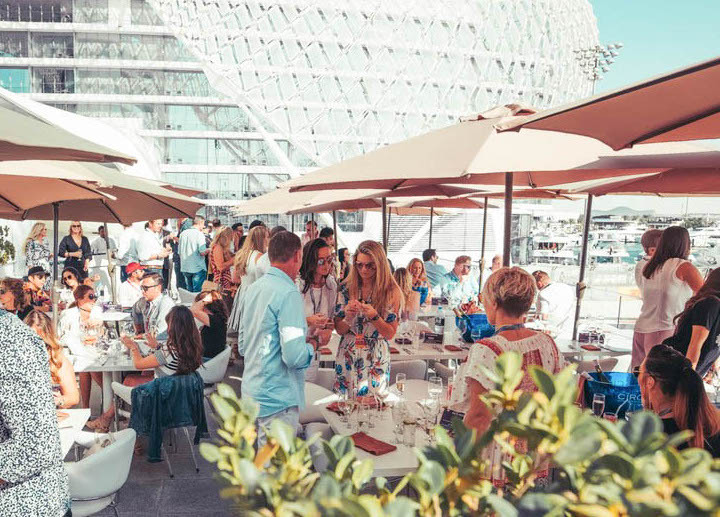 If you have tickets to the racing or even if you don’t the WeBrunch at Yas Hotel is the place to to see, feel and taste the atmosphere of this amazing sporting event. I went last year for my first AD Race Weekend experience and I cannot wait to go again. The brunch is made by the setting itself, overlooking both the track and the amazing hotel. Listening to the cars race by as you enjoy delicious cocktails and great food was a treat worth waiting a year for and a nice change from your every Friday brunch in the UAE. The We Brunch event on the Atayeb Terrace is one not to missed. I can honestly say it’s the best seats in the house with track views from the comfort of your seat! The preeminent food and drink selection and amazing views really puts this event above others. Who wouldn’t want to sit and enjoy a glass of champagne as you see Vettel or Hamilton’s facial expression as he takes the corner in front of you? Abu Dhabi last year was our first experience of a Race weekend and it won’t be our last. The venue on Saturday was terrific and relaxed. The Atayeb brunch terrace had a great view of the best parts of the circuit! The hospitality team served with flair throughout the day. Everyone was relaxed and we all had a blast and enjoyed the party atmosphere. Join us on Friday for an amazing midday brunch. 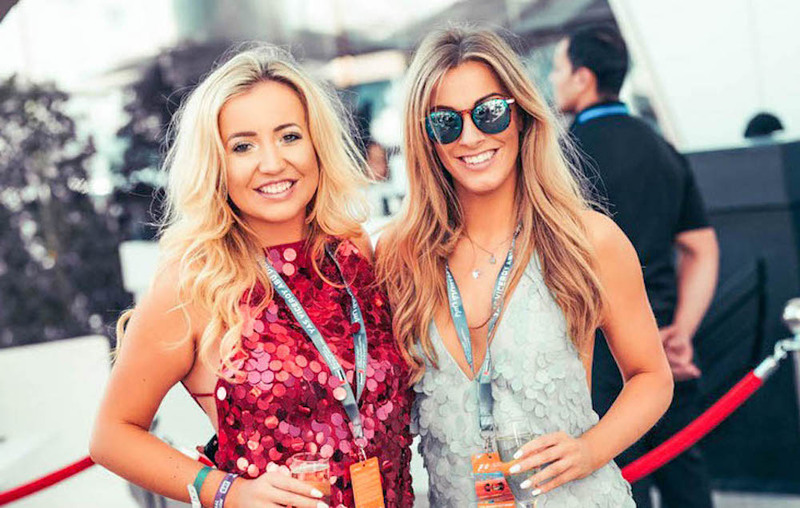 With a back drop of the race circuit and a wide selection of food and free flowing premium drinks all on a beautiful terrace, this stunning venue is like no other. 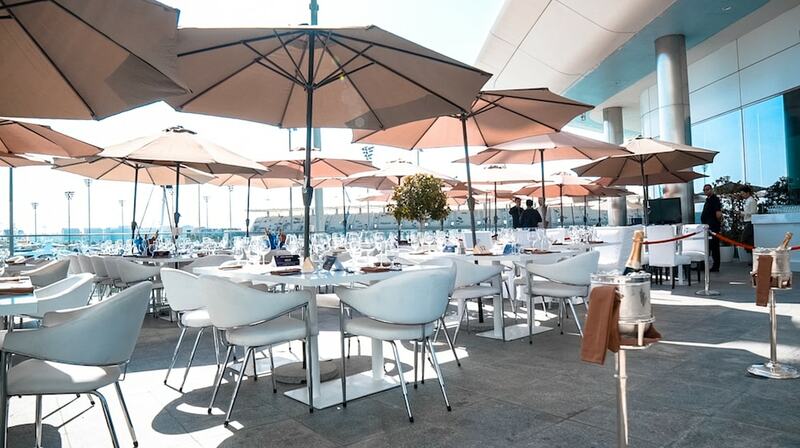 This is the perfect spot to enjoy a festive lunch and take in the atmosphere of the build up to the big Race Weekend. Our Friday evening brunch offers multiple food stations ranging from roast to Sushi ensuring you don't go hungry. 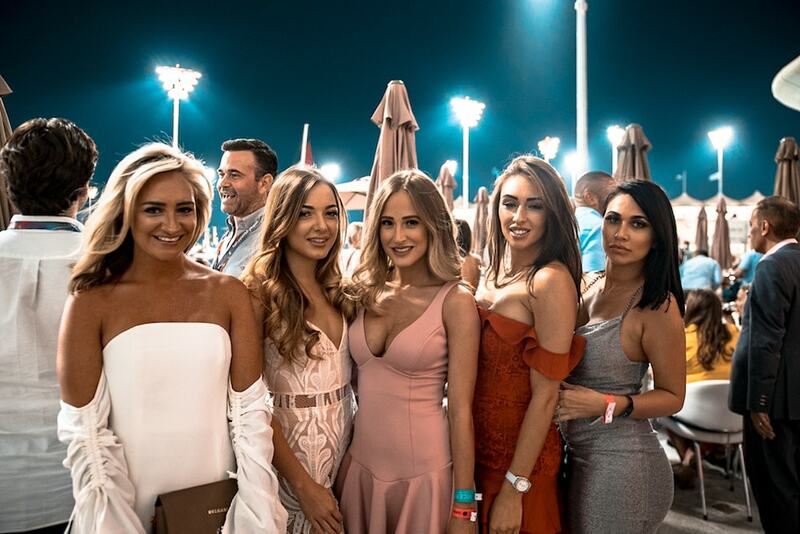 Mix that up with some amazing cocktails and a wide range of premium beverages while watching the sun go down over the track as the cars race past you, and you have the perfect location for your Friday evening. 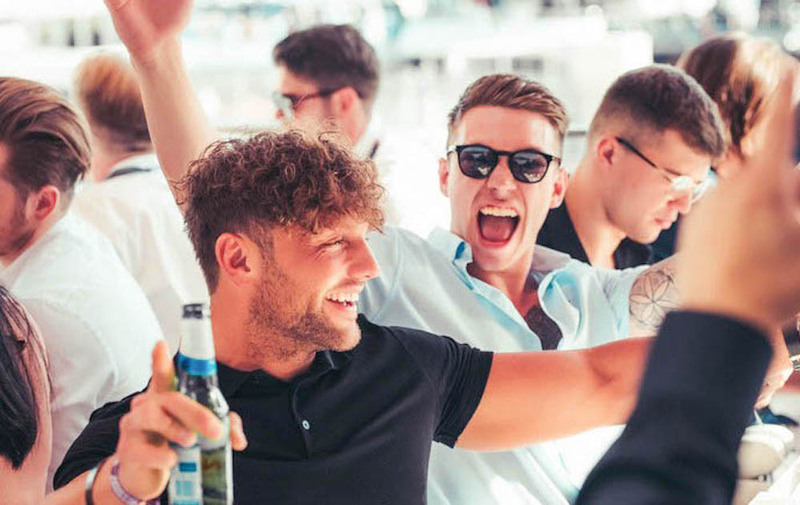 If you’re looking to indulge in an amazing selection of international cuisine, premium free flowing beverages and cocktails while being outdoors and surrounded by stunning track and Marina views then this package is for you! 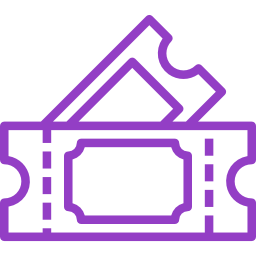 Saturday full day packages allows you to enjoy an amazing day out that gives you the opportunity to enjoy the race from the best seats in the house. For those of you who enjoy a few sundowners before the party really picks up then our terrace package is for you. Come and enjoy all your favorite premium free flowing beverages while listening to the sounds of our live djs, while soaking up the party atmosphere on the Atayeb terrace as the cars race past. Its stunning LED canopy makes the Yas Hotel a truly iconic landmark and one of the world’s most extraordinary hotels. Set amidst the Grand Prix circuit in Abu Dhabi, with a section of the track winding through its arch, this Hotel really is a piece of design innovation. We’ll be hosting an Afterparty on Friday, Saturday and Sunday on the Atayeb terrace with all your favourite djs and drinks deals you can’t say no to. We also offer After Party tables for all three days with minimum spend starting from just 2,000 AED. 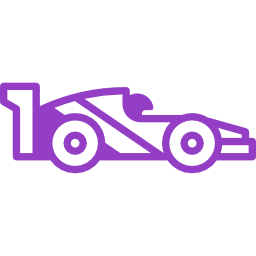 So if you've already booked your brunch feel free to send us your enquiry for a comfortable after-race spot in the most exclusive venue at this year's Race Weekend. 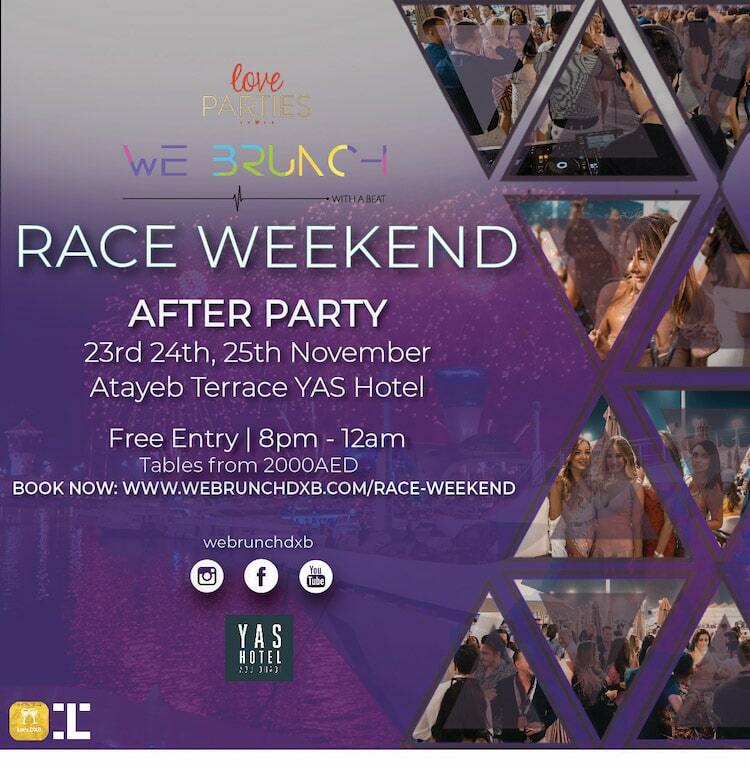 We Brunch Race Weekend is all about keeping the party going all day and that's exactly what you should expect daily from 8:00pm till 12:00am. No, no es necesario ningun conocimiento previo. Lo unico que necesitas es ganas de crecer tu marca en Instagram y un Smartphone. De todas formas lo ideal es hacer el curso desde la computadora para que puedas ir tomando notas. Absolutamente todas. Lo hicimos muy facil para que cualquiera, hasta el que no tenga tarjeta pueda tener acceso al curso. Aceptamos tarjetas, efectivo y transferencia bancaria como forma de pago. Te podes comunicar siempre a nuestro email soporte@galeon.social, respondemos en menos de 1 dia habil y va a ser un placer resolver cualquier duda que tengas. Inmediatamente. Una vez que realices el pago te llegara un email con todas las instrucciones y links para acceder y ya empezar a aprender. Lleva unicamente 2 minutos del momento en el que se realiza el pago hasta que podes empezar a hacerlo! La duracion del curso es de 4 horas dividido en Modulos de 5 a 10 minutos de duracion para hacer tu aprendizaje mas facil y efectivo. 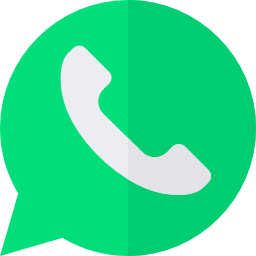 De todas formas recomendamos hacerlo a lo largo de 2 semanas para no abrumarse con la cantidad de informacion y ejercicios practicos. Tan pronto como comiences el curso y apliques lo aprendido ya vas a ver resultados muy rapidamente. Estamos convencidos de que si aplicas lo aprendido, tu marca y la presencia de la misma en Internet va a tener un impacto muy positivo. No, no es posible descargar el material por motivos de protección a nuestra propiedad intelectual. Si! Tenemos un grupo de Facebook en donde ayudamos a todos los miembros que realizaron el curso. De esta manera podes conectarte con gente que esta transitando tu mismo camino! Claro! Si el curso no es para vos y te costó aplicar lo aprendido te devolvemos el dinero sin preguntas! Nuestra garantía de 30 dias te permite probar y si no es lo tuyo te devolvemos el dinero.